Acorelle Organic Hair Growth Inhibitor for Body has been formulated using a patented complex that combines a truffle extract and proteolytic enzymes. It visibly reduces hair density on the small areas of the body and stimulates skin cell renewal. Thanks to its new formulation, Acorelle Organic Hair Growth Inhibitor for Body significantly slows down hair regrowth and makes hair finer. Skin texture is improved, becoming softer and more supple and moisturized. Visible results in just one month ! 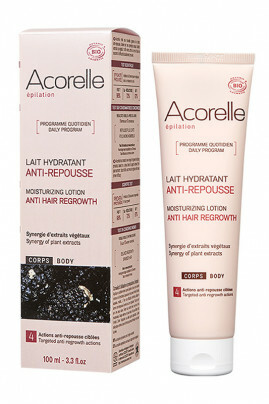 Acorelle Organic Hair Growth Inhibitor for Body works fine after every type of hair removal : wax, cream or even razor. Apply a small amount of Acorelle Organic Hair Growth Inhibitor for Body daily on concerned body zones. CITRUS LIMON (LEMON) FRUIT WATER*, AQUA (WATER) , HAMAMELIS VIRGINIANA LEAF WATER*, ALCOHOL, HORDEUM VULGARE EXTRACT*, CAPRYLIC/CAPRIC TRIGLYCERIDE, DICAPRYLYL CARBONATE, GLYCERIN**, SUCROSE POLYSTEARATE, BUTYROSPERMUM PARKII BUTTER*, CYPERUS ESCULENTUS ROOT OIL*, BEHENYL ALCOHOL, SALICYLIC ACID, CETYL PALMITATE, DIHYDROMYRICETIN, SERENOA SERRULATA FRUIT EXTRACT, TUBER MELANOSPORUM EXTRACT, EPILOBIUM ANGUSTIFOLIUM FLOWER/LEAF/STEM EXTRACT, CUCURBITA PEPO (PUMPKIN) SEED EXTRACT, PARFUM , XANTHAN GUM, CITRIC ACID, TOCOPHEROL, SODIUM PHYTATE, SODIUM HYDROXIDE , SODIUM BENZOATE, POTASSIUM SORBATE, TETRASODIUM GLUTAMATE DIACETATE.